Our tour begins in the First Ward, the birthplace of the citys Irish community. It was here, on the banks of the Buffalo River that the Irish found work after completion of the Erie Canal. The Irish soon became the backbone of Buffalos maritime labor force working in the countless grain elevators that shared their neighborhood. Just as the quint rural pubs of their homeland were centers of the community, the taverns in the First Ward became their collective living rooms...an oasis in the cramped urban setting that they called home. The first tavern on the tour is the Swannie House located at 170 Ohio St. First opened as a bar in the 19th century by the Swanerski family under the name "Swanerski House." Ethnic tensions between the majority Irish and Poles caused the owners to modify the gin mills name to Swannie. The Swannie house serves up a mean bowl of chili that will your soul for the rest of the tour. When you walk out of the Swannie, look right to see Buffalos historic fireboat and take a deep breath of warm Cherrios being made at the General Mills plant located across the Buffalo River. (NOTE: Demolition of McBrides began on March 10, 2008. 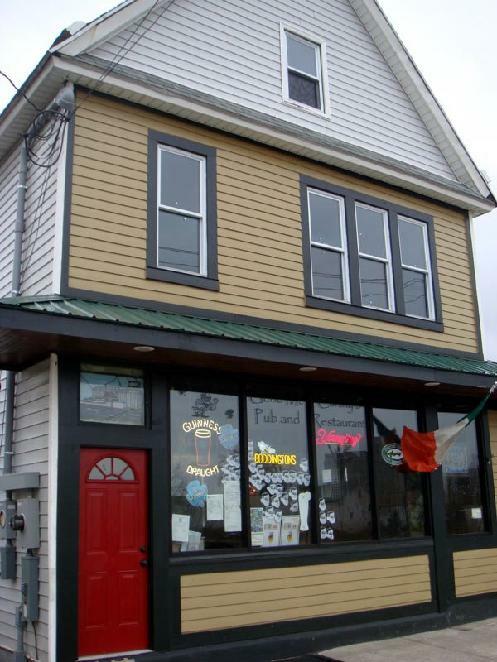 For more information and pictures, visit McBrides on the classic tavern section of this website.) The next stop is McBrides Pub located At 115 Chicago Street. Formally known as Kitty OMalleys, McBride's is an oasis in the industrial heart of the First Ward. Beautiful planked floors and a full menu of Irish beers. Walk out the front door and look at the waterfront's majestic grain elevator skyline. 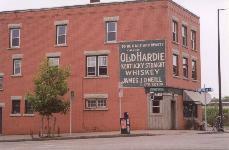 McBride's is the site of two historic events in the history of Buffalo Irish... The Fenian invasion of Canada in 1866 and the planning of the first local St. Patrick's Day Parade in 1913. After McBrides you will venture to the unofficial "City Hall" of the Ward. Gene McCarthy's located at 73 Hamburg St at Republic St. Nestled among industrial buildings, multi-family homes and a network of railroad tracks is Gene McCarthy?s Tavern. McCarthy's is still a favorite of grain workers (General Mills), fire fighters, police and politicians. Watch-out of the "live" train tracks only feet away from the front door! From grain elevators & railroads to arenas & native casinos, the historic make-up of the First Ward is changing at a rapid pace. One historic tavern whose time is limited lies right across the street from the newly claimed "sovereign" territory of the Seneca Nation of Indians. The Malamute at South Park and Michigan Streets is our final stop on the "circle tour" of the First Ward. Proudly displaying Polish, Irish and Italian flags, the Malamute has long been a favorite of the working man "Genny" drinker. It's front door is accessible by climbing a flight of stairs that reminders us of the DL&W railroad viaduct that used to be near by. Swannie House located at 170 Ohio St. First opened the 19th century by the Swanerski family under the name "Swanerski House." Ethnic tensions between the majority Irish and Poles caused the owners to modify the gin mills name to Swannie. When you walk out of the Swannie, look right to see Buffalo�s historic fireboat and take a deep breath of warm Cherrios being made at the General Mills plant located across the Buffalo River. Gene McCarthy�s located at 73 Hamburg St at Republic St. Nestled among industrial buildings, multi-family homes and a network of railroad tracks is Gene McCarthy�s Tavern. McCarthy's is still a favorite of grain workers (General Mills), fire fighters, police and politicians. Watch-out of the "live" train tracks only feet away from the front door! The Malamule, South Part Ave & Michigan St.
Talty's, 2056 South Park Ave. Proudly displaying Polish, Irish and Italian flags, the Malamute at South Park and Michigan has long been a favorite of the working man "Genny" drinker. The tavern is across the street from the former DL&W railroad terminal and site of the future Seneca Buffalo Creek Casino. Blarney Castle, 1856 South Park Ave., 824-5858. A Victorian-looking house on the outside has a drop-ceiling bar and antlered deer heads on the inside. The backroom hosts a pre-parade breakfast extravaganza of green-colored foods. Now that you have learned how to pace yourself, your are ready for the "advanced" tour. The easiest way to start your tour of South Buffalo is to take the 190 to the Seneca Street exit. First stop, Charlie O'Brien's located at 856 Elk Street near Seneca. On the banks of the Buffalo River, the bar has a fireplace in the corner that gives it a cozy feeling. The Buffalo Irish Center will be your next stop located at 245 Abbott Road. This is the center of the city's Irish community with live Irish music almost every weekend of the year. During St. Patrick's Day festivities, prepare yourself for very large crowds. The Irish Center is also home to BIGS (Buffalo Irish Genogical Society) resource library. Filled with books and historical documents, this is the first stop for anyone wishing to learn about thier Irish heritage. Next, the Blarney Castle located at 1856 South Park is in the shadows of Holy Family Church. The Castle features their famous "Green Breakfast" on St. Patrick's Day Parade mornings. Its a pre-parade tradition with an extravaganza of green-colored foods. Doc Sullivan's is located 474 Abbott Road. You have just entered "St. Tommy" parish territory. Doc Sullivan�s is one of the most spacious bars in SB and features a unique style of chicken wing called "Smitty�s Styles." Made with a secret mix of spices, the "Smitty" or "Abbott" wing has a strong taste of nutmeg. Hoppers Rush Inn, 2104 Seneca Street is the perfect place to order a "Genny" out of the historic Bevador cooler. Its a dark, beloved dive where pretense vanishes. Serving corned beef sandwiches during St. Patty's season. A short walk from Hopper�s, is the Blackthorn at 2134 Seneca Street. It is a wonderful neighborhood tradition with one of the best poured Guniness in the City and a classic Buffalo fish frys. Check in the men's room for the famous "9 Lords A Leaking" picture taken at the St. Pat's Parade a few years back. 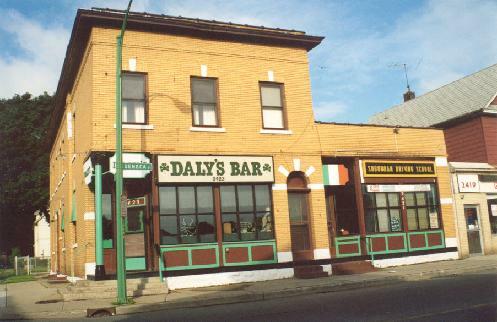 The last stop is Daly's at 2423 Seneca Street. A few doors down from Cannan�s Funeral Parlor, owner Bill Daly says a good wake is good for the bar business. Daly, a former ironworker, bought the tavern in 1957. The last South Buffalo stop before you hit the cityline, the parade crowds make this trip. "Being out this far, they're half pissed up by the time they get here," said a somber Daly. 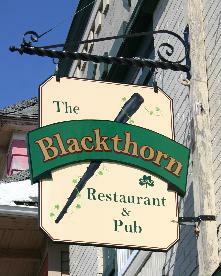 The Blackthorn, 2134 Seneca St., 825-9327. One of the posher bars, with brass and carved wood serves corned beef sandwiches and stew. Should traditional Irish fare fail to excite, check out the "Abbott-Road" hot wings. One of the liveliest and most friendly pubs in South Buffalo. Bar owner Dennis Talty hosts live music on most weekends and is proud to have one of the largest bar shuffleboard tables in Buffalo. Now on to one of the liveliest pubs in South Buffalo... Talty's, located at 2056 South Park Avenue. Owner Dennis Talty one the friendliest bar keeps in the ENTIRE city. The Talty family has been operating pubs on South Park for over 100 years. Tatly's host live music on most weekends and is proud to have one of the largest bar shuffleboard in Buffalo. Be sure to pick up a copy of the "Talty Tattler," a tavern newsletter that comes out approximately every two weeks and is filled with South Buffalo gossip, local news and good old fashion bar humor. Visit Talty's on after the parade for one of the best parties in town. Daly's at 2423 Seneca Street. A few doors down from Cannan�s Funeral Parlor, owner Bill Daly says a good wake is good for the bar business. Daly, a former ironworker, bought the tavern in 1957. The last South Buffalo stop before you hit the cityline, the parade crowds make this trip. "Being out this far, they're half pissed up by the time they get here," said a somber Daly. Gene McCarthy�s located at 73 Hamburg St at Republic St. Although Gene McCarthy has retired and the facade has been updated.... McCarthy's is still the MOTHER of all Buffalo Irish Pubs. Buffalo Irish Center, 245 Abbott Road. Seat of the Irish Community in Buffalo. Entertainment every Friday and Saturday night. Also home of Buffalo's Irish genelogical research library. Get there early on Parade Day and St. Patty's Day as this spacious club will be filled to capacity.